ISS astronauts have been making use of the 3D printer in space to make all kinds of tools for the people up there. Due to the extremely harsh conditions in the vacuum of space, NASA’s 3D printed tools have largely been limited to use within the station itself. But now, the technology is set for another giant leap. 3D printing startup Made in Space has reportedly developed a new material that can be used not only inside the ISS itself, but also in the harsh vacuum of space. 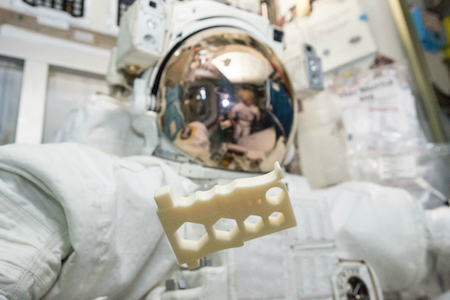 The new material — made from polyetherimide/polycarbonate (known as PEI/PC) — is several times stronger than traditional plastics currently printed on the ISS. When you think about it, it's a handy idea, and much better than the usual approach, which is to think as hard as you can while still on the ground, make the tools, and then send them up. Now, as long as we keep sending the ISS the raw materials, they can make and modify tools on the spot! In their excellent 1974 novel Mote in God's Eye, science fiction writers Larry Niven and Jerry Pournelle described highly intelligent aliens who did everything on the fly, making necessary tools as they went. Sometimes they used a metal paste which could be reused many times. "Now the alien's making something. I don't understand what's keeping it... It's got the cover off the control panel. It's rewiring things. A moment ago it was squeezing silver toothpaste in a ribbon along the printed circuitry. I'm only telling you what it looks like, of course..."
"That thing's on autopilot, would you both agree? But we didn't see him program it." "We saw him practically rebuild the controls, Captan," Cargill said. "My Lord! Do you think that's how they control..."
"Seems verra inefficient, but the beastie did nae else that could hae been the programming of an autopilot," Sinclair mused. "And twas bloody quick about it, sir. Captain, do ye think it built an autopilot?"